Bejeweled 3, the first "true sequel" to the popular decade-old matching game that more than half a billion people have played, hits PopCap.Com and retailers on Dec. 7 for a nickel shy of $20. The game will include reworked music and graphics, "re-imaginings" of the four original game modes of Bejeweled 2 and four new games including Ice Storm and Poker. The game will also include a quest mode with eleven mini-games and 40 quests. 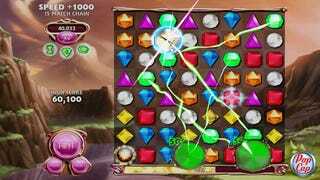 "The challenge in creating a new version of Bejeweled is to innovate and keep it fresh and exciting without losing touch with the game-play that millions of people love," said Jason Kapalka, co-founder and chief creative officer at PopCap and co-creator of Bejeweled. "So we're very careful when we make changes to the core game, which is why it can take so long! "We've worked hard to make sure Bejeweled 3 retains the classic appeal of the earlier games while bringing a host of exciting new features to the table." Recent updates to the Bejeweled formula include Twist and Blitz, pictured above.